In a replay from last month’s Big Ten football championship, highly ranked Michigan State once again put a heartbreaking loss on an undefeated Ohio State team. Only this time the venue was the Breslin Center and the sport was basketball. Keith Appling made a three-pointer from the top of the key in the final 30 seconds and added three free throws to lead the Spartans to a dramatic 72-68 overtime victory. Trailing by 17 points with seven minutes remaining in regulation, the Buckeyes used a 20-3 run to send the game to overtime. Sam Thompson had nine points during the spurt and Shannon Scott came up with a steal with five seconds left, but missed a hard-charging, contested layup for the win. Fifth-ranked Michigan State outscored Ohio State 14-10 during the extra stanza to stave off a furious Buckeye rally and hand them their first loss of the season. In the process, the Spartans staked their claim as the Big Ten’s best. It was fewer than three weeks ago when Ohio State came back from eight down in the final 58 seconds to beat Notre Dame at Madison Square Garden. Michigan State shot a robust 58 percent from three-point range and scored 26 points off a season-high 21 Buckeye turnovers. The turnovers favored the Spartans 17-6 at one point until Ohio State forced seven miscues late in the second half. Michigan State ended up with 17 turnovers for the game. The Spartans have won seven consecutive games since a mysterious home loss to North Carolina in December. Michigan State is 14-1 overall and 3-0 in the conference. The No. 3 Buckeyes fall to 15-1 and 2-1 with an important game against visiting Iowa looming Saturday. Ohio State’s shooting was as frigid as the sub-zero temperatures outside until the late push. Games away from Value City Arena have resulted in poor shooting percentage, with Tuesday’s showing following in line. The Buckeyes shot 41.4 percent the field and 22.2 percent from three-point range. On the season, Ohio State’s three-point percentage is below 20 percent in games away from Columbus. The Buckeyes top two offensive threats – LaQuinton Ross and Lenzelle Smith Jr. – finished a combined 4-of-18 from the field with 12 points. Sam Thompson was the team’s high scorer with 18 points and Marc Loving added 10. Both teams struggled in the first half, clanging shots from afar and missing bunnies. Ohio State only converted nine field goal attempts (33.3 percent), but the Spartans weren’t much better, as they made 11-of-29 field goal attempts in the half. 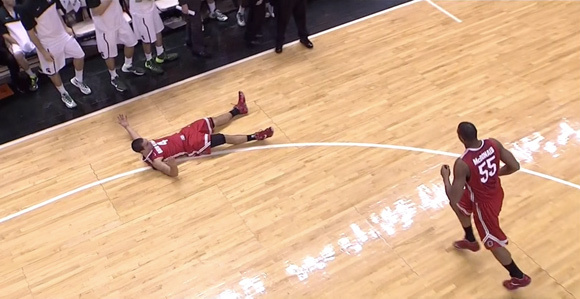 The difference was Michigan State’s five 3s compared to the Buckeyes’ two. Ohio State ended regulation on a 20-3 run. The Spartans stormed out to an 11-5 lead behind multiple three-pointers even as Adreian Payne sat on the bench with a foot sprain. The injury was aggravated during warmups and Payne did not start. Still, he found a way to score 18 points in 32 minutes. Key reserve Travis Trice was out with an illness. Appling led Michigan State with 20 points, six rebounds and seven assists. A veteran-laden Ohio State team looked uneasy the first few minutes, an uncharacteristic quality for the Craft-led Buckeyes. But they secured a lead halfway through the first half until Scott went to the bench with two fouls. The junior guard sat out the final 8:39 of the first half, during which the Spartans outscored Ohio State 14-5, including a 9-0 run over the final 3:40.